Perhaps the most miraculous part of flying isn’t that physics and engineering unite to propel a metal tube through the sky but, rather, that it has become so safe and ordinary that it’s boring to the point of mundane. As economy passengers find themselves crammed into ever smaller spaces, they’re quick to stop marveling at the wonder of flight, preferring to buffer their senses with noise canceling headphones, phone screens, and tiny bottles of gin. Hope, however, persists. 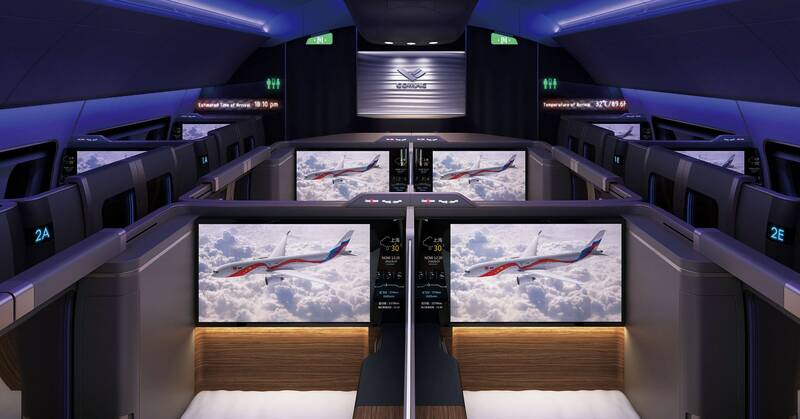 Some of the innovation that has showered first class fliers with luxuries is wafting to the rear of the plane, as the shortlist for this year’s Crystal Cabin Awards, the Oscars of the aviation interiors industry, make clear. And while it’ll be up to the judges to select winners from the 100 submissions—the envelopes will be opened in April at the Aircraft Interiors Expo in Hamburg, Germany—taking an early look gives us a good idea of what’s coming. Collins Aerospace’s M-Flex Duet is a self-service snack bar that can fold out of the way for landing and takeoff. Industry supplier Collins Aerospace wants to reclaim the eight feet or more of open space in front of the emergency exit doors on widebody, twin-aisle jets. Now it’s often the location of a jump seat where a crew member sits for landing and takeoff, and a gathering spot for folks waiting to use the lav. To reclaim the territory, Collins has created the M-Flex Duet. The modular, transforming shelving system folds entirely out of the way into two slim plastic monoliths on either side of the door, for taxi, takeoff, and landing. During flight, it can extend out across the door, providing a self-service snack bar. That’s an extra amenity for flyers, a potential source of revenue for airlines, and a bit less work for aisle-patrolling flight attendants. Germany’s Kruger Aviation also wants to create more space out of wasted areas, this time in the bathrooms. Its Future Lavatory takes up the same amount of space as a conventional bathroom, but angles the toilet diagonally. This apparently gives more room to actually use it, and frees up space for a baby diaper changing station and a new sink angled to reduce the chances of water splashing onto your clean chinos. There are foot rests either side of the toilet, so it can be used in either the Western sitting position or the squatting position more popular in Asia. Kruger calls it the first multicultural toilet. Kruger calls the Future Lavatory aviation’s first multicultural toilet, as it accommodates various seating positions. As with all aviation advances, putting any of this into service will take years of development and certification, and only if the suppliers believe airlines will really pay for these things. But even if flying’s never going back to its golden age—which is fine, if you value cost and safety—there’s reason to believe squeezing into the metal tube might get just a bit easier to stomach.